For other uses, see Nylon (disambiguation). Nylon is a generic designation for a family of synthetic polymers, based on aliphatic or semi-aromatic polyamides. Nylon is a thermoplastic silky material that can be melt-processed into fibers, films, or shapes. :2 It is made of repeating units linked by amide links similar to the peptide bonds in proteins. Nylon polymers can be mixed with a wide variety of additives to achieve many different property variations. Nylon polymers have found significant commercial applications in fabric and fibers (apparel, flooring and rubber reinforcement), in shapes (molded parts for cars, electrical equipment, etc. ), and in films (mostly for food packaging). DuPont's invention of nylon spanned an eleven-year period, ranging from the initial research program in polymers in 1927 to its announcement in 1938, shortly before the opening of the 1939 New York World's Fair. The project grew from a new organizational structure at DuPont, suggested by Charles Stine in 1927, in which the chemical department would be composed of several small research teams that would focus on “pioneering research” in chemistry and would “lead to practical applications”. :92 Harvard instructor Wallace Hume Carothers was hired to direct the polymer research group. Initially he was allowed to focus on pure research, building on and testing the theories of German chemist Hermann Staudinger. He was very successful, as research he undertook greatly improved the knowledge of polymers and contributed to science. The production of nylon required interdepartmental collaboration between three departments at DuPont: the Department of Chemical Research, the Ammonia Department, and the Department of Rayon. Some of the key ingredients of nylon had to be produced using high pressure chemistry, the main area of expertise of the Ammonia Department. Nylon was considered a “godsend to the Ammonia Department”, which had been in financial difficulties. The reactants of nylon soon constituted half of the Ammonia department's sales and helped them come out of the period of the Great Depression by creating jobs and revenue at DuPont. DuPont's nylon project demonstrated the importance of chemical engineering in industry, helped create jobs, and furthered the advancement of chemical engineering techniques. In fact, it developed a chemical plant that provided 1800 jobs and used the latest technologies of the time, which are still used as a model for chemical plants today. The ability to acquire a large number of chemists and engineers quickly was a huge contribution to the success of DuPont's nylon project. :100–101 The first nylon plant was located at Seaford, Delaware, beginning commercial production on December 15, 1939. On October 26, 1995, the Seaford plant was designated a National Historic Chemical Landmark by the American Chemical Society. An important part of nylon's popularity stems from DuPont's marketing strategy. DuPont promoted the fiber to increase demand before the product was available to the general market. Nylon's commercial announcement occurred on October 27, 1938, at the final session of the Herald Tribune's yearly "Forum on Current Problems", on the site of the approaching New York City world's fair. :141 The “first man-made organic textile fiber” which was derived from “coal, water and air” and promised to be “as strong as steel, as fine as the spider’s web” was received enthusiastically by the audience, many of them middle-class women, and made the headlines of most newspapers. :141 Nylon was introduced as part of "The world of tomorrow" at the 1939 New York World's Fair and was featured at DuPont's "Wonder World of Chemistry" at the Golden Gate International Exposition in San Francisco in 1939. Actual nylon stockings were not shipped to selected stores in the national market until May 15, 1940. However, a limited number were released for sale in Delaware before that. :145–146 The first public sale of nylon stockings occurred on October 24, 1939, in Wilmington, Delaware. 4,000 pairs of stockings were available, all of which were sold within three hours. However, the early excitement over nylon also caused problems. It fueled unreasonable expectations that nylon would be better than silk, a miracle fabric as strong as steel that would last forever and never run. :145–147 Realizing the danger of claims such as “New Hosiery Held Strong as Steel” and “No More Runs”, DuPont scaled back the terms of the original announcement, especially those stating that nylon would possess the strength of steel. After nylon's nationwide release in 1940, production was increased. 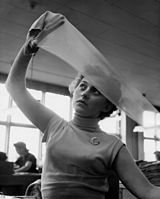 1300 tons of the fabric were produced during 1940.:100 During their first year on the market, 64 million pairs of nylon stockings were sold. :101 In 1941, a second plant was opened in Martinsville, Virginia due to the success of the fabric. While nylon was marketed as the durable and indestructible material of the people, it was sold at almost twice the price of silk stockings ($4.27 per pound of nylon versus $2.79 per pound of silk). :101 Sales of nylon stockings were strong in part due to changes in women's fashion. As Lauren Olds explains: “by 1939 [hemlines] had inched back up to the knee, closing the decade just as it started off”. The shorter skirts were accompanied by a demand for stockings that offered fuller coverage without the use of garters to hold them up. However, as of February 11, 1942, nylon production was redirected from being a consumer material to one used by the military. DuPont's production of nylon stockings and other lingerie stopped, and most manufactured nylon was used to make parachutes and tents for World War II. Although nylon stockings already made before the war could be purchased, they were generally sold on the black market for as high as $20. Once the war ended, the return of nylon was awaited with great anticipation. Although DuPont projected yearly production of 360 million pairs of stockings, there were delays in converting back to consumer rather than wartime production. In 1946, the demand for nylon stockings could not be satisfied, which led to the Nylon Riots. In one case, an estimated 40,000 people lined up in Pittsburgh to buy 13,000 pairs of nylons. In the meantime, women cut up nylon tents and parachutes left from the war in order to make blouses and wedding dresses. Between the end of the war and 1952, production of stockings and lingerie used 80% of the world's nylon. DuPont put a lot of focus on catering to the civilian demand, and continually expanded its production. As pure nylon hosiery was sold in a wider market, problems became apparent. Nylon stockings were found to be fragile, in the sense that the thread often tended to unravel lengthwise, creating ‘runs’. :101 People also reported that pure nylon textiles could be uncomfortable due to nylon's lack of absorbency. Moisture stayed inside the fabric near the skin under hot or moist conditions instead of being "wicked" away. Nylon fabric could also be itchy, and tended to cling and sometimes spark as a result of static electrical charge built up by friction. Also, under some conditions stockings could decompose turning back into nylon's original components of air, coal, and water. Scientists explained this as a result of air pollution, attributing it to London smog in 1952, as well as poor air quality in New York and Los Angeles. 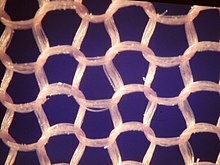 The solution found to problems with pure nylon fabric was to blend nylon with other existing fibers or polymers such as cotton, polyester, and spandex. This led to the development of a wide array of blended fabrics. The new nylon blends retained the desirable properties of nylon (elasticity, durability, ability to be dyed) and kept clothes prices low and affordable. :2 As of 1950, the New York Quartermaster Procurement Agency (NYQMPA), which developed and tested textiles for the army and navy, had committed to developing a wool-nylon blend. They were not the only ones to introduce blends of both natural and synthetic fibers. America's Textile Reporter referred to 1951 as the "Year of the blending of the fibers". Fabric blends included mixes like "Bunara" (wool-rabbit-nylon) and "Casmet" (wool-nylon-fur). In Britain in November 1951, the inaugural address of the 198th session of the Royal Society for the Encouragement of Arts, Manufactures and Commerce focused on the blending of textiles. DuPont went through an extensive process to generate names for its new product. :138–139 In 1940, John W. Eckelberry of DuPont stated that the letters "nyl" were arbitrary and the "on" was copied from the suffixes of other fibers such as cotton and Rayon. A later publication by DuPont (Context, vol. 7, no. 2, 1978) explained that the name was originally intended to be "No-Run" ("run" meaning "unravel"), but was modified to avoid making such an unjustified claim. Since the products were not really run-proof, the vowels were swapped to produce "nuron", which was changed to "nilon" "to make it sound less like a nerve tonic". For clarity in pronunciation, the "i" was changed to "y." In spite of oil shortages in the 1970s, consumption of nylon textiles continued to grow by 7.5 per cent per annum between the 1960s and 1980s. Overall production of synthetic fibers, however, dropped from 63% of the worlds textile production in 1965, to 45% of the world's textile production in early 1970s. The appeal of "new" technologies wore off, and nylon fabric "was going out of style in the 1970s". Also, consumers became concerned about environmental costs throughout the production cycle: obtaining the raw materials (oil), energy use during production, waste produced during creation of the fiber, and eventual waste disposal of materials that were not biodegradable. Synthetic fibers have not dominated the market since the 1950s and 1960s. As of 2008[update], nylon continued to represent about 12% (8 million pounds) of the world's production of synthetic fibers. As one of the largest engineering polymer families, the global demand of nylon resins and compounds was valued at roughly US$20.5 billion in 2013. The market is expected to reach US$30 billion by 2020 by following an average annual growth of 5.5%. Although pure nylon has many flaws and is now rarely used, its derivatives have greatly influenced and contributed to society. From scientific discoveries relating to the production of plastics and polymerization, to economic impact during the depression and the changing of women's fashion, nylon was a revolutionary product. The Lunar Flag Assembly, the first flag planted on the moon in a symbolic gesture of celebration, was made of nylon. The flag itself cost $5.50, but had to have a specially-designed flagpole with a horizontal bar so that it would appear to "fly". One historian describes nylon as "an object of desire", comparing the invention to Coca-Cola in the eyes of 20th century consumers. PA 6 or Nylon 6: [NH−(CH2)5−CO]n made from ε-Caprolactam. PA 66/610 : [NH−(CH2)6−NH−CO−(CH2)4−CO]n−[NH−(CH2)6−NH−CO−(CH2)8−CO]m made from hexamethylenediamine, adipic acid and sebacic acid. 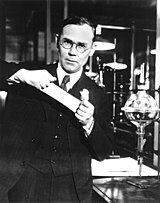 Wallace Carothers at DuPont patented nylon 66 using amides. In the case of nylons that involve reaction of a diamine and a dicarboxylic acid, it is difficult to get the proportions exactly correct, and deviations can lead to chain termination at molecular weights less than a desirable 10,000 daltons (u). To overcome this problem, a crystalline, solid "nylon salt" can be formed at room temperature, using an exact 1:1 ratio of the acid and the base to neutralize each other. The salt is crystallized to purify it and obtain the desired precise stoichiometry. Heated to 285 °C (545 °F), the salt reacts to form nylon polymer with the production of water. The synthetic route using lactams (cyclic amides) was developed by Paul Schlack at IG Farben, leading to nylon 6, or polycaprolactam — formed by a ring-opening polymerization. The peptide bond within the caprolactam is broken with the exposed active groups on each side being incorporated into two new bonds as the monomer becomes part of the polymer backbone. Various diamine components can be used, which are derived from a variety of sources. Most are petrochemicals, but bio-based materials are also being developed. 1,5-pentanediamine (cadaverine) (PMD): starch (e.g. cassava) → glucose → lysine → PMD. Data published by PlasticsEurope indicates for nylon 66 a greenhouse gas footprint of 6.4 kg CO2 equivalent per kg, and an energy consumption of 138 kJ/kg. When considering the environmental impact of nylon, it is important to consider the use phase. In particular when cars are lightweight, significant savings in fuel consumption and CO2 emissions are achieved. Hydrogen bonding in Nylon 6,6 (in mauve). Variation of luster: nylon has the ability to be very lustrous, semi-lustrous or dull. Nylon clothing tends to be less flammable than cotton and rayon, but nylon fibers may melt and stick to skin. Nylon is one kind of fibers used in tire cord. Herman E. Schroeder pioneered application of nylon in tires. Molded nylon is used in hair combs and mechanical parts such as machine screws, gears, gaskets, and other low- to medium-stress components previously cast in metal. Engineering-grade nylon is processed by extrusion, casting, and injection molding. Type 6,6 Nylon 101 is the most common commercial grade of nylon, and Nylon 6 is the most common commercial grade of molded nylon. For use in tools such as spudgers, nylon is available in glass-filled variants which increase structural and impact strength and rigidity, and molybdenum disulfide-filled variants which increase lubricity. Its various properties also make it very useful as a material in additive manufacturing; specifically as a filament in consumer and professional grade fused deposition modeling 3D printers. Nylon can be used as the matrix material in composite materials, with reinforcing fibers like glass or carbon fiber; such a composite has a higher density than pure nylon. Such thermoplastic composites (25% to 30% glass fiber) are frequently used in car components next to the engine, such as intake manifolds, where the good heat resistance of such materials makes them feasible competitors to metals. Begin by rinsing with warm water and smooth by hand. Product can either hang to dry after squeezing moisture out or hang dripping wet. Though nylon articles can dry indoors or outdoors, it is important to keep colored nylon out of too much direct sunlight. The colors can fade after time. When hung to dry, many nylon garments need little to no ironing. If needed, use the iron at around 250° with the article being either damp or dry. A temperature higher than that will cause damage and may melt the plastic-like material. Using a steamer is also acceptable. ^ Vogler, H (2013). "Wettstreit um die Polyamidfasern". Chemie in unserer Zeit. 47: 62–63. doi:10.1002/ciuz.201390006. ^ a b c d Kohan, Melvin (1995). Nylon Plastics Handbook. Munich: Carl Hanser Verlag. ISBN 1569901899. ^ Clark, Jim. "Polyamides". Chemguide. Retrieved 27 January 2015. ^ a b "Nylons (Polyamide)". British Plastics Federation. Retrieved 19 June 2017. ^ "Science of Plastics". Science History Institute. Retrieved 26 March 2018. ^ a b c DuPont (1988). Nylon: A DuPont Invention. DuPont International, Public Affairs. pp. 2–3. ^ a b American Chemical Society National Historic Chemical Landmarks. "Foundations of Polymer Science: Wallace Hume Carothers and the Development of Nylon". ACS Chemistry for Life. Retrieved 27 January 2015. ^ "Wallace Hume Carothers". Science History Institute. Retrieved 20 March 2018. ^ a b McIntyre, J. E. (2005). Synthetic fibres : nylon, polyester, acrylic, polyolefin (1st ed.). Cambridge: Woodhead. p. 10. ISBN 9780849325922. Retrieved 5 July 2017. ^ Travis, Anthony S. (1998). Determinants in the evolution of the European chemical industry : 1900-1939 : new technologies, political frameworks, markets and companies. Dordrecht: Kluwer Acad. Publ. p. 115. ISBN 9780792348900. Retrieved 5 July 2017. ^ a b "Nylon, a Petroleum Polymer". American Oil and Gas Historical Society. Retrieved 21 June 2017. ^ Nicholson, Joseph L. Nicholson; Leighton, George R. (August 1942). "Plastics Come of Age". Harper’s Magazine. pp. 300–307. Retrieved 5 July 2017. ^ a b c d e f g Wolfe, Audra J. (2008). "Nylon: A Revolution in Textiles". Chemical Heritage Magazine. 26 (3). Retrieved 20 March 2018. ^ "The History and Future of Plastics". Conflicts in Chemistry: The Case of Plastics. Retrieved 20 March 2018. ^ a b c d e f g h i j k l m n Ndiaye, Pap A.; Forster, Elborg (2007). Nylon and bombs : DuPont and the march of modern America. Baltimore: Johns Hopkins University Press. p. 182. ISBN 9780801884443. Retrieved 19 June 2017. ^ a b c d e f Kativa, Hillary (2016). "Synthetic Threads". Distillations. 2 (3): 16–21. Retrieved 20 March 2018. ^ a b c d e f g h i j k l m n Meikle, Jeffrey L. (1995). American plastic : A cultural history (1. ppb. print ed.). New Brunswick, NJ: Rutgers University Press. ISBN 0813522358. ^ "Neoprene: The First Synthetic Rubber". chlorine.americanchemistry.com. Retrieved 2018-12-06. ^ a b "Linear polyamides and their production US 2130523 A". Patents. Retrieved 19 June 2017. ^ "A NATIONAL HISTORIC CHEMICAL LANDMARK THE FIRST NYLON PLANT" (PDF). AMERICAN CHEMICAL SOCIETY. Retrieved 26 June 2017. ^ Blakinger, Keri (April 30, 2016). "A look back at some of the coolest attractions at the 1939 World's Fair". New York Daily News. Retrieved 20 June 2017. ^ Sundberg, Richard J. (2017). The Chemical Century: Molecular Manipulation and Its Impact on the 20th Century. Apple Academic Press, Incorporated. ISBN 9781771883665. ^ Actually the most common nylon polymers are made from hexamethylenediamine, with one more CH2 group than cadaverine. ^ a b Colbert, Judy (2013). It Happened in Delaware. Rowman & Littlefield. p. 60. ISBN 978-0-7627-9577-2. ^ Olds, Lauren (2001). "World War II and Fashion: The Birth of the New Look". Constructing the Past. 2 (1): Article 6. Retrieved 19 June 2017. ^ a b Krier, Beth Ann (27 October 1988). "How Nylon Changed the World : 50 Years Ago Today, It Reshaped the Way We Live--and Think". LA Times. 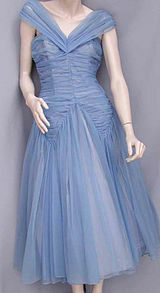 ^ "Parachute Wedding Dress, 1947". Smithsonian National Museum of American History. Retrieved 20 June 2017. ^ "Woman's Home Companion". 75. Crowell-Collier Publishing Company. 1948: 155. ^ Digest, Reader's (2002). New complete guide to sewing : step-by-step techniques for making clothes and home accessories. London: Reader's Digest. p. 19. Retrieved 26 June 2017. ^ "How to buy a trail bed". Backpacker. 5 (3): 70. 1970. Retrieved 26 June 2017. ^ Mendelson, Cheryl (2005). Home comforts : the art and science of keeping house. New York: Scribner. ISBN 978-0743272865. Retrieved 26 June 2017. ^ Shaeffer, Claire (2008). Claire Shaeffer's fabric sewing guide (2nd ed.). Cincinnati, Ohio: Krause Publications. pp. 88–90. ISBN 978-0896895362. ^ Cheremisinoff, Nicholas P. (2002). Handbook of air pollution prevention and control. Amsterdam: Butterworth-Heinemann. p. 65. ISBN 9780080507927. ^ Stern, Arthur C., ed. (1970). Air pollution and its effects (2nd ed.). New York: Academic press. p. 72. ISBN 978-0-12-666551-2. Retrieved 26 June 2017. ^ Garte, Seymour (2008). Where we stand : a surprising look at the real state of our planet. New York: AMACOM. p. 60. ISBN 0814409105. Retrieved 26 June 2017. ^ Haggard, John V. (16 May 1957). "Chapter III: Collaborative Procurement of Textiles". Procurement of Clothing and Textiles, 1945-53. 2 (3): 79–84. ^ a b Handley, Susannah (1999). Nylon: The Story of a Fashion Revolution. Baltimore, MD: Johns Hopkins University Press. p. 68. ISBN 978-0756771720. Retrieved 26 June 2017. ^ GOODALE, ERNEST W. (16 November 1951). "THE BLENDING & MIXTURE OF TEXTILE FIBRES & YARNS". Journal of the Royal Society of Arts. 100 (4860): 4–15. JSTOR 41368063. ^ Algeo, John (2009). The Origins and Development of the English Language. 6. Cengage. p. 224. ISBN 9781428231450. ^ a b c Wilson, Sheena; Carlson, Adam; Szeman, Imre (2017). Petrocultures: Oil, Politics, Culture. Montreal, Quebec: McGill-Queen's University Press. p. 246. Retrieved 26 June 2017. ^ "Market Report: Global Polyamide Market". Acmite Market Intelligence. December 2014. ^ Welsh, Jennifer (21 May 2016). "The American Flags on the Moon Have All Turned White". Business Insider. Retrieved 14 April 2017. ^ Platoff, Anne M. (1993). "NASA Contractor Report 188251 Where No Flag Has Gone Before: Political and Technical Aspects of Placing a Flag on the Moon". NASA. Retrieved 26 June 2017. ^ Ratner, Buddy D. (2013). Biomaterials science : an introduction to materials in medicine (3rd ed.). Amsterdam: Elsevier. pp. 74–77. ISBN 9780080877808. Retrieved 5 July 2017. ^ Denby, Derek; Otter, Chris; Stephenson, Kay (2008). Chemical storylines (3rd ed.). Oxford: Heinemann. p. 96. ISBN 9780435631475. Retrieved 5 July 2017. ^ "Diamine-dicarboxylic acid salts and process of preparing same US 2130947 A". Patents. Retrieved 19 June 2017. ^ "Synthetic fiber US 2130948 A". Patents. Retrieved 19 June 2017. ^ "Fiber-reinforced composite articles and methods of making them CA 2853925 A1". Patents. Retrieved 19 June 2017. ^ Magat, Eugene E.; Faris, Burt F.; Reith, John E.; Salisbury, L. Frank (1951-03-01). "Acid-catalyzed Reactions of Nitriles. I. The Reaction of Nitriles with Formaldehyde1". Journal of the American Chemical Society. 73 (3): 1028–1031. doi:10.1021/ja01147a042. ISSN 0002-7863. ^ Lakouraj, Moslem Mansour; Mokhtary, Masoud (2009-02-20). "Synthesis of polyamides from p-Xylylene glycol and dinitriles". Journal of Polymer Research. 16 (6): 681. doi:10.1007/s10965-009-9273-z. ISSN 1022-9760. ^ Gotro, Jeffrey (May 6, 2013). "Bio-Polyamides: Where Do They Come From?". Polymer Innovation Blog. ^ "Process for producing 1,9-nonanedial US 4510332 A". Patents. Retrieved 19 June 2017. ^ "Preparation of xylylenediamines US 2970170 A". Patents. Retrieved 19 June 2017. ^ "Ajinomoto and Toray to Conduct Joint Research on Biobased Nylon". Toray. 3 Feb 2012. Retrieved 23 May 2015. ^ "Durethan® is the trade name for our range of engineering thermoplastics based on polyamide 6 and polyamide 66". LANXESS Energizing Chemistry. Retrieved 19 June 2017. ^ "Polyamide Resins for an Extreme World Flagship Rilsan® PA11 and Complementary Resins & Alloys". Arkema. Retrieved 19 June 2017. ^ "VESTAMID® L—polyamide 12". EVONIK. Retrieved 19 June 2017. ^ "Stanyl® Polyamide 46: Driving change in automotive". DSM. Retrieved 19 June 2017. ^ "EcoPaXX: The green performer". DSM. Retrieved 19 June 2017. ^ "ForTii® Pushing peak performance". DSM. Retrieved 19 June 2017. ^ "zytel - PA6, PA610, PA612, PA66 - dupont". Material Data Center. Retrieved 19 June 2017. ^ "Zytel® 74G33EHSL NC010". DISTRUPOL. Retrieved 19 June 2017. ^ a b Kutz, Myer (2011). Applied plastics engineering handbook processing and materials (1st ed.). Amsterdam: William Andrew. p. 5. ISBN 9781437735154. Retrieved 19 June 2017. ^ "DuPont TM Selar® PA 2072" (PDF). DuPont. Retrieved 19 June 2017. ^ "Grilamid L PA12". EMS. Retrieved 19 June 2017. ^ Samperi, Filippo; Montaudo, Maurizio S.; Puglisi, Concetto; Di Giorgi, Sabrina; Montaudo, Giorgio (August 2004). "Structural Characterization of Copolyamides Synthesized via the Facile Blending of Polyamides". Macromolecules. 37 (17): 6449–6459. doi:10.1021/ma049575x. ^ "Adhesive for nylon & kevlar". Reltek. Retrieved 27 January 2015. ^ Berners-Lee, Mike (2010). How bad are bananas? : the carbon footprint of everything. London: Profile Books. p. 112, table 6.1. ^ Eco-profiles and Environmental Product Declarations of the European Plastics Manufacturers: Polyamide 6.6. Brussels: PlasticsEurope AISBL. 2014. ^ Typically 80 to 100% is sent to landfill or garbage dumps, while less than 18% are incinerated while recovering the energy. See Francesco La Mantia (August 2002). Handbook of plastics recycling. iSmithers Rapra Publishing. pp. 19–. ISBN 978-1-85957-325-9. ^ "Approximate Time it Takes for Garbage to Decompose in the Environment" (PDF). NH Department of Environmental Services. Retrieved 31 March 2018. ^ Boydell, P; Bradfield, C; von Falkenhausen, V; Prautzsch, G (1995). "Recycling of Waste from Glass-reinforced nylon resins". Engineering Design. 2: 8–10. ^ Maile, Kelly (January 18, 2019). "How abandoned fishing nets are recycled into nylon". Recycling Today. Retrieved 15 March 2019. ^ Campbell, Ian M. (2000). Introduction to synthetic polymers. Oxford: Oxford Univ. Press. ISBN 978-0198564706. ^ "Measurement of Moisture Effects on the Mechanical Properties of 66 Nylon - TA Instruments Thermal Analysis Application Brief TA-133" (PDF). TA Instruments. Retrieved 19 June 2017. ^ Bjarnason, J. E.; Chan, T. L. J.; Lee, A. W. M.; Celis, M. A.; Brown, E. R. (2004). "Millimeter-wave, terahertz, and mid-infrared transmission through common clothing". Applied Physics Letters. 85 (4): 519. doi:10.1063/1.1771814. ^ "Flammable clothing". The Children’s Hospital at Westmead. Retrieved 5 July 2017. ^ Workshop on Mass Burns (1968 : Washington, D.C.) (1969). Phillips, Anne W.; Walter, Carl W., eds. Mass burns : proceeding of a workshop, 13-14 March 1968 / sponsored by the Committee on Fire Research, Division of Engineering, National Research Council and the Office of Civil Defense, Dept. of the Army. Washington, D.C.: National Academy of Sciences ; Springfield, Va. : reproduced by the Clearinghouse for Federal Scientific & Technical Information. p. 30. Retrieved 5 July 2017. ^ Caruso, David (2009). "Saving the (Wedding) Day: Oral History Spotlight" (PDF). Transmutations. Fall (5): 2. Archived from the original (PDF) on July 12, 2016. ^ "Engine Oil Pan". www.materialdatacenter.com. Retrieved 19 June 2017. ^ "Nylon Machining & Fabrication | ESPE". www.espemfg.com. Retrieved 2018-08-28. ^ Youssef, Helmi A.; El-Hofy,, Hassan A.; Ahmed, Mahmoud H. (2011). Manufacturing technology : materials, processes, and equipment. Boca Raton, FL: Taylor & Francis/CRC Press. p. 350. ISBN 9781439810859. ^ "NYLON 6,6 (Nylon 6)" (PDF). Serrata. Retrieved 19 June 2017. ^ "Nylon 6 vs. Nylon 66: What's the Difference?". PolyOne. Retrieved 5 July 2017. ^ "Fiberglass and Composite Material Design Guide". Performance Composites Inc. Retrieved 27 January 2015. ^ Page, I. B. (2000). Polyamides as engineering thermoplastic materials. Shawbury, Shrewsbury: Rapra Technology Ltd. p. 115. ISBN 9781859572207. ^ "How do you take care of a nylon 66 or 77? You don't". Field & Stream. 75 (9). 1971. ^ Sweeney, Patrick (2013). Glock deconstructed. Iola, Wis.: Krause. p. 92. ISBN 978-1440232787. ^ Colbert, Judy (2013). It happened in Delaware : remarkable events that shaped history (First ed.). Morris Book Publishing. ISBN 978-0-7627-6968-1. ^ "Oven Bags". Cooks Info. Retrieved 19 April 2015. ^ a b c "The History of Classical guitar strings". Maestros of the Guitar. Retrieved 27 January 2015. ^ Bellow, Alexander (1970). The Illustrated History of the Guitar. New York: Franco Colombo. p. 193. ^ a b c d DuPont (1950). Care of Nylon. DuPont. pp. 1–8. Kohan, Melvin (1995). Nylon Plastics Handbook. Munich: Carl Hanser Verlag. ISBN 1569901899. 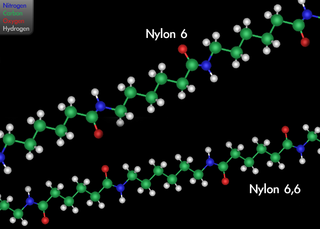 Wikimedia Commons has media related to Nylon. Joseph X. Labovsky Collection of Nylon Photographs and Ephemera Science History Institute Digital Collections. (High-resolution scans of nylon-related photographs and ephemera collected by Joseph X. Labovsky, a lab assistant to Wallace Carothers, during the early stages of nylon development and production at DuPont).